This July, there are so many different exciting things going on in Baltimore that the whole month is virtually a celebration, not just Independence Day! On Friday, July 2 and Saturday, July 3, there will be a celebration all day for the 30th Anniversary of Harborplace. This celebration will include live music, a fashion show, a 1980’s costume contest, walking tours, and much more entertainment that is fun for people of all ages. Also taking place at H arborplace on Saturday, July 3 from 1-2 pm will be a crab eating contest at Phillips Seafood Harborplace. This will surely be a fun activity to watch, but especially to participate in! It’s also that time of year again for Little Italy’s Open Air Film Festival! 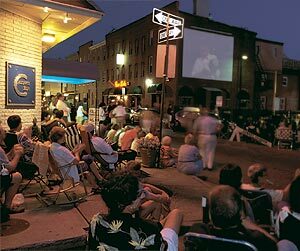 For those who aren’t already familiar with this event, during July and August each Friday night, you can enjoy live music starting at 7pm and them watch a free film outside projected on the side of one of the buildings in Little Italy at 9pm. All you have to bring is a lawn chair to sit on and you’re all set for a fun night! The films are shown at the corner of High and Stiles Streets which is within walking distance if you are staying with us at the 1840s Carrollton Inn. The first film will be shown on Friday, July 2, and it will be Moonstruck, the Italian-American classic! To see the rest of the movies scheduled to be shown in July and August, visit Little Italy’s website. To stay informed about more upcoming events scheduled to be taking place in Baltimore, make sure to keep checking our blog. Also, if you are interested in staying at the 1840s Carrollton Inn, give us a call at 410-385-1840 or visit our website to make reservations!